Hope is described as a feeling of expectation and desire for a certain thing to happen. We have all experienced it. There is always something we are moved by, something we believe we will get or be at some point… something we hope will happen or yearn for. But what happens to hope when what we “hope” for can’t ever actually be? I got news that one of the strongest, most resilient, and determined women I have ever had the privilege to know, passed away after battling cancer for many years. I always thought that if determination could kill cancer, her disease would be gone in no time. She had a great husband, beautiful son, and supporting family by her side. They were her inspiration and her strength, and she never gave up the fight. If there was something out there that could help her in her fight, she didn’t hesitate to go after it. I wanted her so badly to succeed... I wanted her to prove to that terrible disease that the human spirit always wins. I hoped, wished, and prayed for her to win the fight and many of the people who knew her did as well. I was devastated by the news of her passing even though we weren’t that close. I then realized that my sadness was partly because I wanted her to have the end of the story I wanted for myself yet didn’t get. Over six years ago, my husband was diagnosed with stage 4 cancer. By the time he developed symptoms and we found it, it was already in his brain and spine. However, he was a healthy 34 year old with an incredibly positive attitude towards life. Not to mention, he had two small children, a supporting family, and a network with resources and means to help him in any way possible. We never gave up the fight. I actually never let the idea of losing him enter my mind, as long as I didn’t believe it could happen, I thought it would not materialize. I was filled with hope. Even weeks after his death, I would wake up hoping I would tell him about this terrible nightmare I had where he was sick and passed away. But it wasn’t a nightmare, it was reality… What happens to the hope we had and held onto so tightly for so long after our loved ones die? Feelings of hopelessness are usually inevitable. In fact, they are very common in grieving people and in those who are suffering or caring for the terminally ill. Hopelessness feels as if there is nothing to be optimistic for anymore because there is nothing that can be done. But before hopelessness, came hope. Hope moved us into action—an invisible force that pulled us into believing our desires can come true. In fact, hope is defined as the “perceived capability to derive pathways to desired goals, and motivates oneself via agency thinking to use those pathways,” according to professor C. R. Snyder in his Hope Theory. In other words, in order to be hopeful we need to be able to come up with pathways (ideas, strategies, tasks, ways) of how to go about achieving what we are hoping for and we need to believe in our capacity to pursue, sustain, and achieve them. Essentially, hopefulness is when we find a way(s) and are confident in ourselves to get what we want. For example, if the goal is a desperate desire for our loved ones to regain their health, we will come up with pathways to achieve that by taking our loved ones to treatments and specialists, watching their diet, etc… as well as believing in our capacity to help them through it. Losing hope is simply the opposite. It leaves us immobile in a space where nothing motivates us to keep going. When we lose hope, we experience a lot of negative emotions. 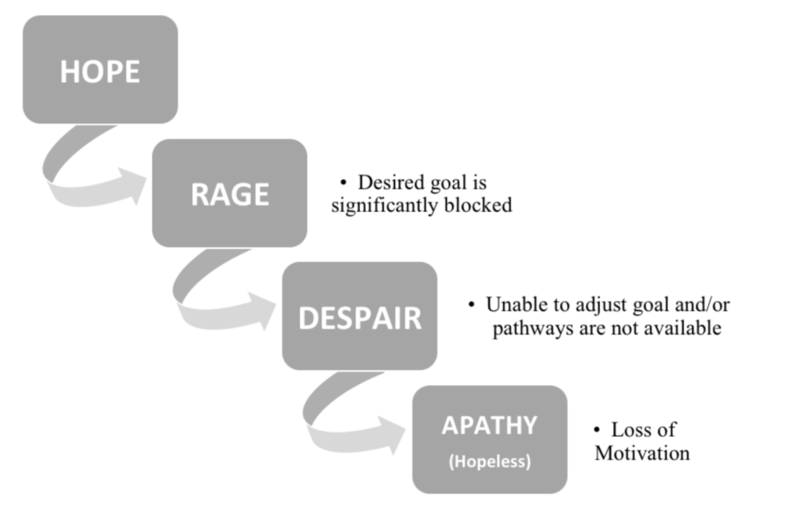 The paper “A Primer On Hope As A Theory of Change for Human Service Providers” explains that the first phase in the loss of hope is rage, as we are unable to find pathways to achieve our highly desired goal. When we are unable to be in motion, we can become frustrated, especially when we are not ready to give up. Figure 1. The Loss of Hope. “A Primer On Hope As A Theory of Change for Human Service Providers” by Chan M. Hellman; Jody A. Worley; and Ricky T. Munoz. University of Oklahoma. Rage is followed by despair. When what we want cannot be attained and we recognize our desire/goal as insurmountable, we will question the meaning and value of our efforts. In the face of death, this could be as fundamental as questioning the meaning of life: “Why do we try at life if we are going to die regardless? Why do we try so hard?” This is very normal and rooted in the fact that we cannot derive a pathway that avoids death—not for our loved ones, not even for ourselves. During the feelings of despair, we are still directing mental energy towards the desired goal. This can be felt in the form of questioning what could have been done differently: “what ifs,” etc… although at some point we get to the conclusion that we can’t bring our loved ones back and/or nothing can be done. In the final phase of the loss of hope, which is apathy, no more mental energy is expended and no more pathways to achieve the goal are considered. Apathy is often characterized as a lack motivation in both thoughts and behavior, which is the complete opposite of hope. Hopelessness is one of the lowest-spirited emotions we can experience. When we are moved powerfully by a deep desire for something, and it does not materialize, it is understandable that filling that emptiness will take time. However, hope can be nurtured back into our lives. The key is to create new desired goals that we can progress towards. The goals do not have to be big, they can be as simple as getting ourselves out of bed and into motion. Even with something very simple, in the stage of hopelessness, we may find ourselves seeing more barriers than pathways towards the achievement of our goals. It then becomes important to find alternative pathways to achieve our goals which may include external help such as getting support from a friend, family member, or counselor. This is a critical step towards nurturing hope. Next, is the phase of creating future memories by describing what we want to feel, what impact we want to make/see, and what success would look like. As we achieve little goals, we will reinforce our ability to create pathways and our capacity to achieve our goals thus nurturing hope back into our lives again. Figure 2. Nurturing Hope. “A Primer On Hope As A Theory of Change for Human Service Providers” by Chan M. Hellman; Jody A. Worley; and Ricky T. Munoz. University of Oklahoma. The main takeaway is that hope needs a pathway towards something achievable that we believe we can achieve. We will always be hopeful that our loved ones will be with us for a long time but when we lose them, it is natural to become hopeless. However, nurturing hope back into our lives is possible because it is our hopeful selfs that will strive to spend more precious time with loved ones, experience laughter, express our love, share deeper connections, help others with our talents, remember our memories with our loved ones, etc… everything worth reaching for starts with hope.